After roasting a duck that came from this farm, I saved some meat and made a broth with the bones. The final product even tastier than the roast duck dinner. I used the duck broth, some of the meat, white wine, lots of wild mushrooms and some parmesan to give it loads of flavour. This would also be great without the duck, maybe using some chicken, or a vegetarian dish using vegetable broth instead. 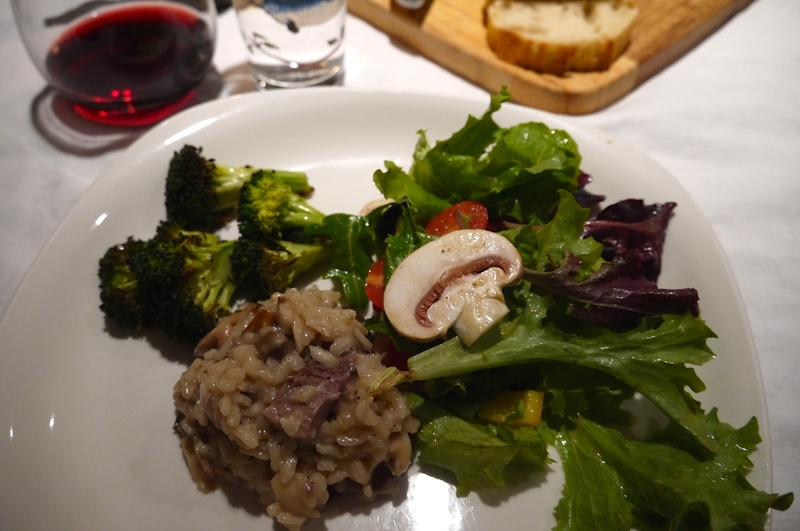 Risotto isn’t difficult to make; it just takes some attention, as you need to stir it frequently and add the liquids slowly so it ends up with a nice creamy texture. I found this recipe on the blog ‘Bossy Italian Wife.’ I changed the recipe a little by mixing some Parmesan into the risotto instead of just using it as a garnish. I also used wild mushrooms rather than button, but feel free to use what you can find or like. Also I didn’t have gravy to add to the risotto, but it was really good without it. This makes two generous portions, or can be used as an appetizer for four people. Heat the duck fat at medium-high heat in a medium-sized pot. Add the garlic and mushrooms and cook until they begin to brown. Add the rice to the pot and stir it for about a minute, allowing it to brown. Turn the heat down to medium. Add the wine to the pot and stir until it is absorbed into the rice. Don’t rush this process. Some good music will allow you to enjoy the stirring, and you’ll end up with the best risotto. Add a ladle-full of stock to the rice, stirring until it is absorbed. Keep adding, stirring, allowing each portion of stock to be absorbed before adding more. It should take about 20-30 minutes to cook the rice completely. Towards the end of the cooking time, begin testing the rice by biting into a piece to see if it is done. If it is still crunchy, keep cooking. When the rice is done add the duck meat and Parmesan. Let the duck heat through, then serve immediately, topped with a little more Parmesan cheese.